NEW ORLEANS — The battle between the Pac-12 and the SEC in terms of total The Bowerman Award Watch List members shifted in favor of the conference out west this week when women from Arizona State and Southern California jumped on the Mid-Outdoor Season The Bowerman Award Watch List, as announced by the U.S. Track & Field and Cross Country Coaches Association (USTFCCCA) on Wednesday. Sun Devils thrower Maggie Ewen and Women of Troy sprinter Kendall Ellis put together solid months to tip the balance, giving the Pac-12 6 women on this edition of The Bowerman Award Watch List to the SEC’s 4. Kendall Ellis JR Southern California Sprints Pembroke Pines, Fla.
Ewen – making her debut on The Bowerman Award Watch List – has been nothing short of spectacular in the hammer, discus and shot put for the Sun Devils this year. The 1st woman from Arizona State to see her name on the watch list since Anna Jelmini did so back on March 20, 2014, Ewen recorded the 2nd-best hammer throw mark in outdoor collegiate history at the Baldy Castillo Invitational in mid-March, posting a throw of 72.71m (238-6). No one is within 15 feet of her on the descending order list this season. On top of that, the native of St. Francis, Minnesota, sits 2nd in the nation in the discus with a personal-best mark of 59.83m (196-3) – the winning throw at the Pac-12 vs. Big-10 Invitational – while also recording the 7th-best furthest shot put mark in NCAA Division I this year at 17.39m (57-0¾). Ellis also entered the collegiate outdoor record book when she and 3 others joined forces to run a 3:26.27 in the 4×400 relay at the Texas Relays, putting she and her Southern California teammates as the 6th-best performers in that event in history. Individually, the native of Pembroke Pines, Florida, ran the single-fastest 400 meter time collegiately this season at the LSU Battle on the Bayou, finishing in 50.98. Late last month, Ellis recorded what is now the 10th-best 200 meter time in the nation this year, wrapping up with a wind-legal 22.79 at the Trojan Invitational. Joining Ewen and Ellis from the Pac-12 on the Mid-Outdoor Season Bowerman Award Watch List are Oregon’s Raevyn Rogers, Hannah Cunliffe, Deajah Stevens and Ariana Washington. Rogers had arguably the best month out of the aforementioned Ducks from a historical standpoint. The junior from Houston, Texas, broke a 27-year-old record in the 800 meters at the Mt. SAC Relays, running a 1:59.10. Her time bested Suzy Favor’s mark – set on June 1, 1990 – by one one-hundredth of a second. Additionally, Rogers anchored the Ducks’ 4×400 relay squad that currently sits atop the descending order list, having run a 3:26.07 at the Florida Relays. After a brutally tough indoor campaign, Cunliffe made her outdoor debut 3 weeks ago at the Florida Relays, helping Oregon run the now-3rd fastest time in outdoor collegiate history in the 4×100 relay with a time of 42.34. She bested that just two weeks later at the Mt. SAC Relays, as she, Makenzie Dunmore and fellow Bowerman Award Watch List honorees Stevens and Washington lowered the collegiate record they set in the 4×100 at the Florida Relays with a time of 42.12. In addition to her record-setting mark in the 4×100, Stevens was outstanding at the Mt. SAC Relays in individual events as well. The native of Westchester, New York, posted the top times in the nation on the season in the 100 meters (11.00) and the 200 meters (22.31), the latter of which was into a headwind. Her 11.00 mark in the 100 meters is ranked as the 9th-best performance in collegiate outdoor history. Washington was right behind her teammate Stevens in the 100 meters at the Mt. SAC Relays, finishing in 11.06 for the 2nd-fastest time on the NCAA Division I descending order list. The product from Signal Hill, California, was also ran a blistering 23.93 in the 200 meters, good for 16th in the nation this year. While the Pac-12 might lead the pack in numbers, the SEC’s athletes are no slouches. Georgia’s Kendell Williams and Ole Miss’ Raven Saunders recorded national-leading marks in the last few weeks, while Kentucky’s Sha’Keela Saunders continued to build upon her strong outdoor season. Williams posted the 5th-best heptathlon mark in collegiate outdoor history at the Spec Towns National Team Invitational in early April, scoring a total of 6354 points. She was also outstanding in other events, as she tied for the 3rd-best high jump mark in the nation this year at 1.85m (6-0¾) in addition to setting the 13th-best long jump mark on the year (6.35m/20-10) and the 14th-fastest 100 hurdle time (13.17). Raven Saunders took advantage of competing at home by setting the national-leading shot put mark of 18.51m (60-8¾) at the Ole Miss/Joe Walker Invitational in late March. In the same meet, she recorded what is now the 16th-best discus toss on the year (54.91m/180-2). Just last weekend, Sha’Keela Saunders notched a wind-aided 6.57m (21-6¾) in the long jump at the Texas Invitational, good for 3rd on the descending order list. On the track in Austin, Texas, the native of Suffolk, Virginia, helped the Wildcats put together the 21st-fastest 4×400 relay this year at 3:35.51. Saunders also owns a season-best triple jump mark of 12.50m (41-0¼). Georgia’s Keturah Orji found herself on the Watch List once again, but has yet to open up her outdoor campaign after a national championship-winning season on the indoor circuit. 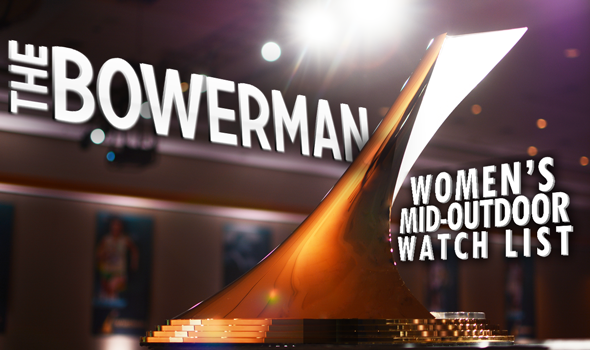 Falling off the Watch List – but still receiving votes – was Karissa Schweizer of Missouri and Sasha Wallace of Oregon. Joining the pair was Notre Dame’s Anna Rohrer.